Lake Effect Works to Save Century Old Cabin from falling in Brule River. Lake Effect Construction has been trusted to work on some of the most pristine lands in norther wisconsin. A general contractor can often offer landscaping options to homeowners or business owners in addition to building homes and other buildings. Lake Effect Construction, located in the northern Wisconsin town of Washburn, can help plan and implement landscaping design into the overall visual effect of a home or business construction project. A homeowner or a business owner who wants to change an existing landscape plan or design a completely new landscape needs to consider several different things. One of the most important things to think about as you start to plan your landscape is whether you have any experience at all in design, implementation or maintenance. Many people consider landscaping a do-it-yourself type of project, but that's not the case at all. A professional landscaper has the education and experience needed to properly create an outdoor space for a home or business that will look good and last for years. As you plan your landscape, you’ll need to think about the size of the area you’ll be working with. If you’re planning to create a small flowerbed or rock garden, you can probably do some research, then go ahead and create the landscape feature. However, if you’ve just had a house built on a vacant lot, or your business needs extensive landscaping, it’s best to consider hiring a professional landscaper. Especially with large jobs, a professional landscaper will take into consideration factors you probably haven’t even thought about. For example, you’ll need to look at the pitch and drainage features of the space that needs to be landscaped, so that erosion or standing water won’t become a problem. A professional landscaper knows how to incorporate the strengths and weaknesses of the space to be landscaped into the design. A landscape professional will talk with you to determine how you would like the finished landscape to look. A professional knows how to combine flowers, shrubs, trees, water features and other elements to create a visually pleasing design that complements the architectural design of the building it surrounds. A professional is also an expert in the types of flowers, shrubs and trees will work well in the lighting, soil and climate of your area. If you, as an inexperienced landscaper, choose plants that look good in a catalog without taking into account their growing requirements, you’ll likely lose a lot of money as the plants quickly die. A landscape professional can help you avoid making expensive mistakes. 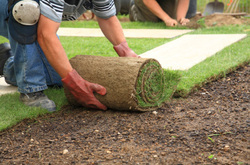 Your landscape will need to be maintained once it has been created and implemented. You might inadvertently create a landscape yourself that requires constant maintenance that you didn’t plan to do. A landscape professional will know how to create an outdoor space that meets your maintenance requirements as closely as possible. A professional can also give you advice on ways to change your landscape according to the seasons by using annual flowers to visually emphasize different colors or areas of the landscape. Lake Effect Construction, a general contractor and construction company in Washburn, Wisconsin, is dedicated to listening to its customers to make sure the project they envision is the project that is ultimately completed. The company is committed to using green building design and energy efficient products, which they will incorporate in landscape design wherever possible. Lake Effect Construction can give you landscaping advice, or design and implement a landscape for you, from start to finish, that brings out the features of your space to their best advantage.